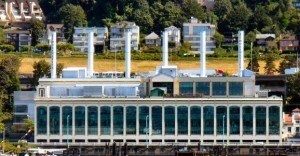 The Zymogenetics Headquarters Lake Union Steam Plant building, a concrete frame structure 90 feet wide and 316 feet long, was completed in 1921; it had a power generating capacity of 30,000 kilowatts. Adjacent to the south end of the Steam Plant is the landmark Hydro House, which was constructed in 1912. The Hydro House site is still connected by a 3,400 foot long, 30-inch wide pipe to the original water source at a 412 foot higher elevation known as the Volunteer Park reservoir. 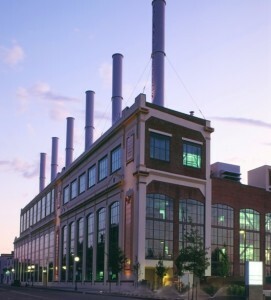 The exterior of the Lake Union Steam Plant has been restored to its original grandeur; the interior has been converted to a state-of-the-art biotechnology research and development facility. The architectural restoration followed the guidelines established by the Seattle Landmark Preservation Board to ensure that the preservationist the historical, visual integrity of the building design while accommodating adaptive reuse needs and current building and energy codes. Recalling the open character of the original steam plant’s interior, the 113,000 square feet of space available for laboratory and office use takes full advantage of the building’s sweeping views. Since the lab areas are the primary work spaces, the areas have been kept as open as possible and located on the Lake Union side of the building. The design of first floor of the plant houses ZymoGenetics’ corporate and administrative offices. The four upper floors are architecturally designed and houses laboratories, including molecular and cellular biology, DNA and molecular pharmacology, tissue culture, and protein chemistry. Each specialised laboratory has its own offices, equipment rooms, and support areas. ZymoGenetics’ work philosophy creates an open, interactive environment that enhances scientific productivity. The architecturally designed and renovated facility features numerous common areas. The structure of center bay of the building is the focal point of its interior, both spatially and functionally. A sloped glass wall at the entry extends full height to the bottom of the existing roof trusses. Balconies with space to meet and talk surround this three-story space. From the entry, the main floor opens to the opposite wall, allowing views of the lake beyond. This openness is repeated on each floor. The buildings architectural design also consists of 12,450-sq-ft of parking space in the basement.